The following is from the November 2008 Drilling Down Newsletter. Got a question about Customer Measurement, Management, Valuation, Retention, Loyalty, Defection? Just ask your question. Also, feel free to leave a comment. Q: In our business (airline) – particularly on the loyalty side – we’ve been using both RFM as well as lifetime and current cumulative totals. For instance in our mileage program, we look at both lifetime miles earned and used as well as current balance. A: Well, I guess the question is appropriate for what purpose, what action are you driving to? For example, if you were to divide metrics into “strategic” and “tactical”, meaning “for management / long-term planning” and “for campaigns / taking short-term action” then you get different answers. Lifetime Miles earned is more of a strategic idea, as in “how many folks do we have that have flown over 100,000 miles?” and of course you want to see that number grow over time. If it doesn’t, there may be some fundamental flaw in the business that needs to be addressed by management – service, scheduling, pricing, something beyond the every-day sort of campaign stuff that Marketing might handle. On the other hand, if you combine LifeTime Miles with “source”, as in how did we acquire this customer, and you find out 50% of the folks with over 100,000 Lifetime Miles joined the Loyalty program through an offer made in Amex credit card statements, you now have a tactical idea that tells you to focus on more marketing opportunities like the one that generated 50% of your best customers. As far as miles used and current balance, we know that in loyalty programs, redeemers tend to be the least likely to defect – they are paying attention and the awards are attractive. In other words, the metric “percent customers redeeming” rising means the program is structured well, customers like it, and the program is doing the job. There are basically two types of redeemers – savers and spenders. If you are going to “take action” from a marketing perspective, you can look at other metrics that are more along the lines of Customer Engagement for these different behavioral segments. For example, large unused balances can be indicative of “saving”, as long as the balances are below the top rewards. When they go over the top rewards and keep growing, that’s a sign of customer apathy among best customers towards the program. So you can look at various “thresholds” and decide what kind of action to take to keep the program fresh and exciting for best customers. For point spenders – those that use points to upgrade or fly free as soon as they have enough to cover the redemption – you might wonder why these folks would pass the normal threshold foe these activities and keep saving. If you see this behavior combined with a slowdown in trip frequency, you start to worry about a defection and take action through “double points” offerings or special rewards designed to maintain engagement. Q: It’s very easy to create lots of RFM style scores – but is there any way to combine them into a single usable metric – even along a single dimension. For instance in the very simplest case – is there a way to combine the level of importance of R, F, and M by understanding their relative importance on future potential value? LTV? A: Well again, it kind of depends what you are using all this information for. Most of the predictive power of RFM is in Recency, so if predicting defection is what triggers marketing action you can skip the “FM” and just use R. But if you are scoring folks because you are reporting on valuation or want to know relative rankings of customers by Value and likelihood to defect then you need all the parts. Sure, you can create any kind of “summing” algo you want and turn it into a “single number”. If you are talking about some kind of management reporting, and you’re just trying to simplify for the exec level, why not? But, here’s the problem with summing disparate metrics that don’t have the same fundamentals. If you lose the detail and are talking about using scores for marketing actions, most of the time you end up kicking yourself for not saving the detail and you need to go back and recreate it by unraveling the equations. Plus, Recency is very unlike any of the Frequency or Volume-oriented metrics – the base is Time, not Activity. 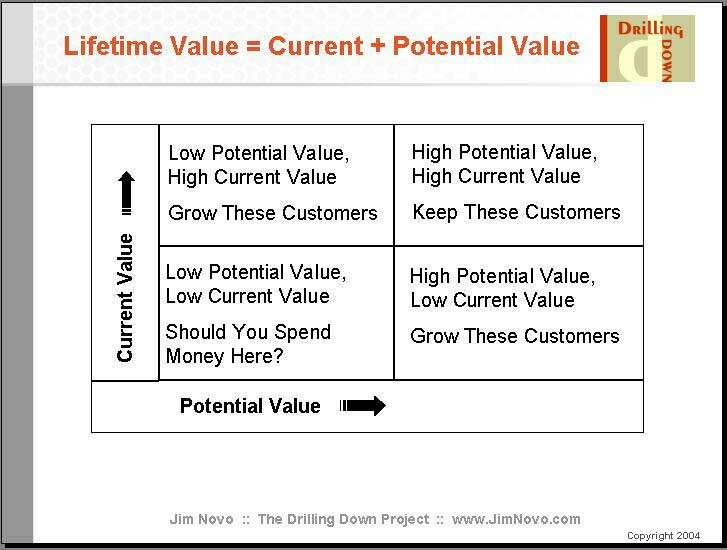 This will lead to interpretation problems down the road, as the interactions between the Activity / Volume and Time vectors (Current Value / Potential Value) are the most powerful ideas to act on in terms of Customer ROI, not a subjective blend of these disparate ideas. Also, just to clarify in case there is some confusion, most customers will have many different RFM scores during their LifeCycle, so RFM score in itself in not predictive of terminal value. Variables surrounding the acquisition and servicing of the customer – the customer experience – are predictive of LTV, but RFM score is not. You need to be looking at campaign source of customer, what routes they fly, what times of day they fly, behavior in the loyalty program, etc. to predict LTV. What RFM is predictive of is “the delta” from a point at time when the score is assigned, the “future” part of LTV. RFM ranks customers against each other for magnitude of future value and likelihood of capturing this future value at a point in time – the Potential Value. As I said above, you can use Recency alone for a proxy, but I don’t think that is going to get you where I think you want to go. And to clarify, an RFM score does predict along a single dimension, if I understand your meaning of dimension. If you score purchases, you get a likelihood of purchase; if you use visits to score you get a likelihood to visit, but not to purchase. I think what you are trying to ask is how you combine all these various RFM scores that each predict a single action into a single, more complex and accurate prediction; and to me that means you are ready for CHAID, CART, and regression models. Congratulations! They are much easier to build with a rich data set of existing behavioral scoring data like the RFM data set you seem to have. So for example, imagine you have dozens of RFM scores on different behaviors. You identify some high value defectors, and the question is this: which of these dozens of scores is most predictive of the defection, or in what order of importance are they in making a prediction of defection? You are looking for “patterns” of RFM scores that predict a defection, for example “high RFM score on miles with a rapidly increasing RFM score on calls to customer service”, meaning a best customer is having service trouble. You’ve now crossed into the advanced behavioral modeling area, because now you are talking about using multiple variables to predict a behavior; you’re looking for “weights” to apply to a bunch of different data points that result in “single usable metric” you can use to describe a customer. These advanced models sound like the next chapter in your customer-centric quest. I don’t think you will ever get to a “single usable metric” – you will need a separate model for each likelihood you are trying to predict – but you can get to the idea of “single usable metric along a single dimension” using many different inputs with these models.